UNITED NATIONS, December 13 -- Management responses to humanitarian crises can be as dry as footnotes, but it is the UN's work. Thursday the Central Emergency Response Fund garnered more commitments than ever, after a slide show of its work was shown to member states. 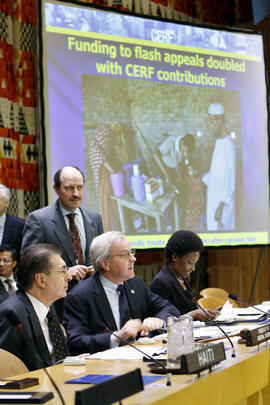 According to the slides, the CERF has spent $337 million in 2007, including $22 million in Bangladesh. That funding followed the November 15 cyclone. After a formal application for aid on the night on November 19, the following day the UN approved release of funds. This is called rapid response, and appears to have worked in this instance. The CERF also has an "under-funded emergency window," according to humanitarian coordinator John Holmes. This window appears to work more slowly, as for example a request by the World Health Organization for funds for the Democratic Republic of the Congo remains pending. Inner City Press asked how the under-funded window in fact works. Holmes said that twice a year, the percentage of fulfillment of the UN's Consolidated Appeals are considered. Hitting seventy percent of the appeal is normal; at fifty percent, a country is considered under-funded, and the CERF can fill in the gap. To member states John Holmes said that the criteria for funding is that a project must be life-saving. Inner City Press asked about a $1 million grant by the CERF in Somalia to the UN Development Program, which was labeled as for "Security." John Holmes acknowledged that UNDP does have a program to train the Transitional Federal Government forces (which have been accused of killing and even targeting civilians), but said that CERF's money wasn't for this. His spokesperson later specified that the $1 million to UNDP was for building a bunker and communications hub, rehabilitating a space to meet Minimum Operational Safety Standards. We'll have more on this. Because a number of Inner City Press' UN sources go out of their way to express commitment to serving the poor, and while it should be unnecessary, Inner City Press is compelled to conclude this installment in a necessarily-ongoing series by saluting the stated goals of the UN agencies and many of their staff. Keep those cards, letters and emails coming, and phone calls too, we apologize for any phone tag, but please continue trying, and keep the information flowing.